Space is a common issue most people face and that’s why seek for things that saves them space. A coffee maker is one such thing that might take up a lot of counter space if not selected carefully. French Press, Aeropress and Chemex are space saver, but they take up a lot of time and need much manual work. Also, they leave the kitchen a lot messed up if you are new to use them. Offices and all need some automated solutions that can be easily used by anyone seeking a cup of hot coffee. You are here right now because either you are short on space or maybe the kitchen space is too small. 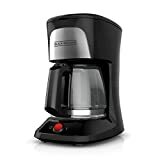 But the good news is that there are a number of mini coffee makers that make use of forgotten spots such as the underside of your cabinets via an underside drawer or inside the wall in your kitchen too. If you are seeking one for traveling purpose, we have another collection of Portable Coffee Makers specifically designed for that. Whatever the nature of your space limitations, you can find the perfect coffee maker for your needs. If you don’t think wisely before buying one, you might end up occupying a large area of your counter from a big gizmo. There are smart choices available in this category. Counting on the ‘space’ factor, we thought to come up with a best picks. This simple quality drip coffee machine makes full use of vertical space, which may be exactly you need if you don’t have under counter space and also less area on the counter top. 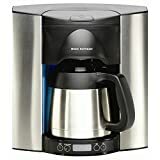 Although it isn’t marketed specifically as a spacesaver coffee maker, this model has few features that make it ideal for certain types of cramped kitchens. The tall narrow shape means less of your counter-top’s surface area will be used up. The swivel base allows you to remove or fill the water reservoir without pulling the coffee maker out from under the cabinet. Most of all, people on the whole are happy with the coffee that this Hamilton Beach model brews. The brewing temperature is high enough. Some people want to keep their coffee as hot as possible while others worry about it getting a burnt taste, so the adjustable burner temperature is a great way to keep everyone happy. Maybe some people report that the front panel has some tendency to fall off when the brew basket is opened or closed. Another common complaint is that it’s not possible to sneak a cup of coffee in the middle of brewing. 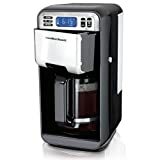 But overall, this Hamilton Beach coffee maker is a popular choice with consumers. It does seems like, in the small coffee makers list, Kitchen Aid KCM1202WH is the most beautiful one. This coffee maker has an even smaller footprint than the Hamilton Beach. Kitchen Aid is available in either white or onyx black, and has a rounded shape in contrast to the boxy design of the Hamilton Beach. It’s not false to say that it is probably one of the most beautiful coffee makers available. Both of the colors have their own charm. While this machine makes a good cup of coffee, it also keeps it hot for a couple of hours. Note that it uses a flat basket filter (the picture on Amazon’s page is a bit misleading), which maybe some people find inferior to cone filters. Overall this is a popular machine with consumers. Some find it a bit messy: because, the lid of the brew basket collects a lot of condensation, which can spill everywhere when you lift it. Others have said that the pause function doesn’t work quite as well as advertised. 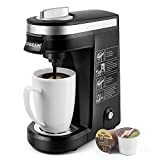 This machine, like the others reviewed here, is programmable so that you can wake up to freshly brewed coffee. Some owners find that the clock tends to lose time, so make sure you check it before you go to bed at night! Otherwise, this is a great choice if you’re looking for a coffee maker that doesn’t hog too much of your counter. Overall, this model has mixed reviews. Many customers love the look of the machine and the fact that it saves valuable space in the kitchen. Most also report that it makes great cup of coffee at hot enough temperature. The problem seems to be that few of these machines arrive with defective carafes that leak or fail to keep coffee hot. These cases are rare but if you do order one and it has a dripping, malfunctioning carafe, it’s best to return it right away for a replacement. It’s worth noting that customer service contacts people who leave negative reviews online to attempt to resolve their problems. 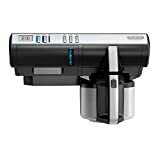 The features of Black & Decker SCM2000BD Spacesaver Coffee Maker are almost similar to that of 1000BD and differ just in design and size aspects. The carafe here is made of stainless steel that keeps coffee hot for hours. The dimensions of this coffee maker are a bit shorter and hence it takes smaller footprint. The installation process is similar to that of the 12-cup model, and it mounts easily under the counter saving a valuable space on the counter. With this single cup coffee maker, you can brew a cup of coffee in just a 1 or 2 minutes with just a single press of button. It’s a pod brewer that is compatible with most of the pods available in the market. You can use K-cups by Keurig that are easily available anywhere. Do not use the Nespresso coffee capsules as they are meant for espresso. This coffee maker can be easily seen in many offices, dorms and homes too and the reason behind is its easy operation and durable construction. It has a removable drip tray for easy cleaning. The only thing we didn’t liked in this is small water reservoir of 12 oz and the solution I found for this is keeping a jug full of water nearby this coffee maker. Braun has recently introduced its series of Brew Sense coffee makers that really makes sense. The appearance of these brewers is modern and appealing. With very clean construction and large bold display, this coffee maker is very easy to use. The brewer comes with Pure Flavor Brewing System that gives consistent flavor till the last drop of coffee. What’s more, it’s programmable on-off, comes with 2 brew strengths, 1-4 cup selection, self cleaning, and 3 keep warm temperatures. The carafe lid is designed to pack the flavors inside even after brewing. It’s a 12 cup coffee maker but it’s just 7.9 inches wide so takes a very less space on counter. With durable stainless steel construction and 5 year warranty, Kenmore coffee maker is a peace of mind. It even looks modern and unique with its great designing. It’s a 12 cup coffee maker with vertical visible water tank on the back. The brewer comes with 24-hour programmability and a reusable gold tone filter that can be easily removed and washed. The water tank is also removable for easy cleaning. It also comes with a charcoal filter that removes the impurities from the water. The carafe is also designed keeping an eye on convenience. The broad handle grips well and the easy pour design allows easy pouring in the mugs. With an amazing design, this coffee maker has already won over 2900 reviews on Amazon and that keeps growing. If you are seeking a drip brewer that has minimal controls and perfect brewing mechanism, this is your end of search. With optimal brewing temperature, this coffeemaker gives the taste you might have been missing from years. It even has fast brew technology that brews 2 minutes faster when compared to other coffee makers in similar category. It has a brew strength selector too that makes a strong cup if needed. The brew filter is removable for easy cleaning and is dishwasher safe. Another amazing appliance to merge in your kitchen is the Nostalgia BESET300. It actually is not a small appliance but rather, it combines 3 operations in one unit and hence saves space of actually two appliances we generally use. This product by Nostaligia combines a Coffee Brewer, a Griddle and also a Toaster which are used frequently. For very small kitchens, it is like a gem. It has the mostly used functions that are needed to prepare the breakfast and what’s more, you can keep the prepared food hot in the griddle. The griddle is non stick and has transparent lid for easy cooking too. 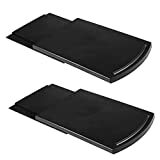 Additionally, both the griddle and toaster tray are removable for easy cleaning. The coffee maker brews 4 cups at a time and that is a general consumption for a single family. Also, the coffee it brews is perfect and one is simply going to love it. While, the only drawback is that it brews only for 4 people and you have to brew it a few more times if there are more guests. 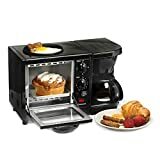 Finally, for less than a 100 bucks, this Breakfast station cuts the cost of 3 appliances and saves space too. It’s a steal and a must buy for every small home and students too as they are always in need of space saving things. It’s also a perfect thing to be given as a gift to your loved ones. If you are interested in the Breakfast Station by Nostalgia, then this product by Elite might also captivate your interest. It almost has a same set of features as in our Nostalgia product, but this one is much even more compact in size, and for small kitchens, this really matters. Instead of large griddle, the Elite Breakfast Station has a small 6-inch diameter non stick griddle for taking over your frying needs. The length of the whole product is merely 17 inches, so a lot of space is saved. This Elite Break fast Gizmo is a wonderful product and a great companion for small kitchens, RV owners or may be Yacht owners. A lot can be done with this single machine saving the space of 2 extra gadgets. The coffee maker is almost same with 4 cup capacity and Pause N Serve feature that allows to pour the coffee in between brewing. It’s also available in attractive colors to suit your kitchen and personality needs – Black, White, Blue and Red. The other product that picked up our interest is a combination of Pop Up Toaster and a Coffee Maker, again by Elite Cuisine. It’s simple, very small and can fit almost anywhere in your kitchen. The dimensions are 15.75 x 8.86 x 7.48 inches, and that’s a lot of space saving. If you love to have toast with your coffee, than this appliance can be a good fit. The controls are very simple, especially the coffee maker. It’s a single serve 8 oz brewer that has just an On/Off switch and a reusable filter. The 2- slice extra wide pop up toaster has 7 shades setting for various tastes and a convenient cancel button. It’s available in either black or red color. Another product to be praised is the Brew Express Built in Coffee System that attaches itself inside the wall and saves space on the counter. Like a mountable coffee maker, this also saves space by utilizing the place were nothing else can be used. To install this coffee system, we have to prepare some gap in the wall so that the Brew Express can sit inside that space. The outer part then just left is merely 3-4 inches. Overall, a lot of space is saved that none other thing can use. It also has some smart functions like automatic filling of water (connects directly to tap), adjustable cup selector and programmable timer so that you can wake up with a fresh cup of coffee every morning. Moreover, the coffee maker is built to last for years. It is tested thoroughly for thousands of cycles and hence no worries about reliability here. If you are looking for ways to make your coffee maker under the counter, here is a small way out. An under counter tray is available that can be easily equipped either under cabinets or even counter tops. It can then be pulled out whenever needed. This sliding tray can hold about 25 lbs of weight and most of the drip brewers are under that. The width of this tray is 12 inch so keep an eye on your coffee maker width before buying. We hope you have already found a selection from the above products. If not, you can use the sliding tray to keep your coffee maker under the cabinets as that will also help you save space. The above coffee makers are also good for RV or Houseboats as there minimum footprint allows them to fit almost anywhere.